People who has complete the downloading process for Windows 7 Build 6956 VHD virtual hard disk image will face a critical stop error issue, that the VHD cannot be loaded, started or booted up. As the VHD is imaged from an actual physical computer, the hardware specification, hard disk drives (especially on SATA, ACHI and boot sequence settings) and drivers installed can be totally different and not compatible, causing users who attempt to use the VHD has the system partition to boot Windows 7 6.1.6956 encounter boot device error or BSoD. As such, a workaround hack has to be used in order to mount the Windows 7 Beta Build 6956, a possible actual beta candidate. In fact, the workarounds is actually the steps to install Windows 7 Build 6956 from the VHD image. The installation can be done onto a actual physical machine, or a virtual machine powered by Virtual PC, Virtual Server, Virtual Box, VMWare, Hyper-V and etc. There are plenty of methods to install Windows 7 build 6956 into your PC, but the concept is essentially the same: User will need to copy the Windows 7 system files from the VHD to a partition that he or she wants the Windows 7 build 6956 to run, and then make sure the boot sector is OK, and if required, to reset the Windows 7 to clean original state. Thus the steps detailed below is just for a guide, and the actual implementation may vary according to your own need, or the tool that you have. All methods below is for ‘upgrade installing’ (not exactly upgrade, as existing data will be lost) existing partition with Windows 7 build 6801 to build 6956, but it may also works for new partition, harddisk or machine. Windows 7 Build 6801: Last known Windows 7 pre-beta build that has properly installation DVD image. All methods below require an existing installation of Windows 7 build 6801. WinMount: An utility to attach or mount supported files as a newly created virtual drive. Norton Ghost: An utility to backup computer with system restore technology. Acronis True Image: A backup and recovery software (Free Acronis True Image 8.0, or alternative free Seagate DiscWizard or Maxtor MaxBlast). Mount or attach the VHD in Windows 7 (have to download and install Windows 7 build 6801 for this purpose) Disk Management, or with WinMount in non-Windows 7 system such as Windows Server 2003, Windows Vista and Windows XP. A new drive should be created from the VHD image mounted. Copy and paste ALL files in the VHD drive to another partition or drive. Restart the computer and boot into another operating system such as Windows XP, Windows Vista or WinPE. Format the Windows 7 build 6801 partition. Copy the Windows 7 build 6956 over to formatted Windows 7 build 6801 partition. 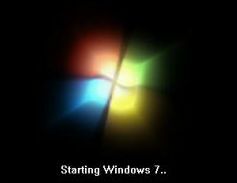 Note: It’s possible for users to format the existing Windows 7 build 6801 partition first, boot into WinPE with WinMount or another operating system, and the copy over the new 6956 build files to the formatted partition. If this method doesn’t work properly (as hardlinks, symbolic links and junction points may not be copied over), or has error message saying files in used or cannot copy over, try the following method. A new drive should be created from the VHD image attached. For users using WinMount, it’s usually labeled as Z drive letter. Download and install Norton Ghost from Symantec, Acronis True Image (note that both software is not free), or O&O DiskImage (free license). Make a full backup of the Windows 7 build 6956 (in attached VHD) with Norton Ghost (.v2i) or Acronis True Image. Save the backup file at a third-party not affected drive or partition. Restore the backup of Windows 7 build 6956 from the VHD to existing Windows 7 build 6801 volume. An alternative method for users running Windows 7 as system boot drive is to boot with Norton Ghost or Acronis True Image recovery startup CD, and then initiate computer recovery process to restore the backup to a drive or partition. These methods now become informational, as the setup installation ISO (DVD image) for Windows 7 build 6956 has been created and available for free download. After performing steps above, and upon system restart to boot into new Windows 7 build 6956, a Windows Boot Manager error may appear. In this case, boot the system with Windows 7 build 6801 DVD, and then perform a Startup Repair. In most cases, Windows RE (Recovery Environment) will automatically detects an error once user clicks on “Repair your computer”, and fix the boot sector and MBR accordingly. On startup, if the loading stuck or stopped while loading classpnp.sys (or to small extent fvevol.sys), or simply displays the infamous BSoD (Blue Screen of Death), the problem is probably due to ACHI support. To resolve the issue, restart the computer and go to BIOS, and then change the setting from ACHI mode to IDE mode. Users can re-enable the ACHI after performing the generalization process below. Note: For users using virtual machine such as VPC 2007 who fails with above error, try another virtualization software such as VirtualBox. If for some reason you can see the new boot screen of Windows 7 build 6956 after perform the generalization step using System Preparation Utility (SysPrep) below, then download the W7-BootScreen.rar, which contains original BCD and BCD.rcbak files from build version 6956 of Windows 7. Users can boot up with WinPE to overwrite the same files in C:\Boot directory, or using command prompt to do so. As the VHD is actually a running copy of Windows 7 installation on another machine, so some settings or components such as personalization, drivers support, features support, hardware specifications (such as ACHI) support and activation grace period has been changed or modified. In order to restore and reset Windows 7 installation back to its original out-of-the-box experience (OOBE) state, users can run the SysPrep command. The command is located in C:\Windows\System32\sysprep\sysprep.exe.